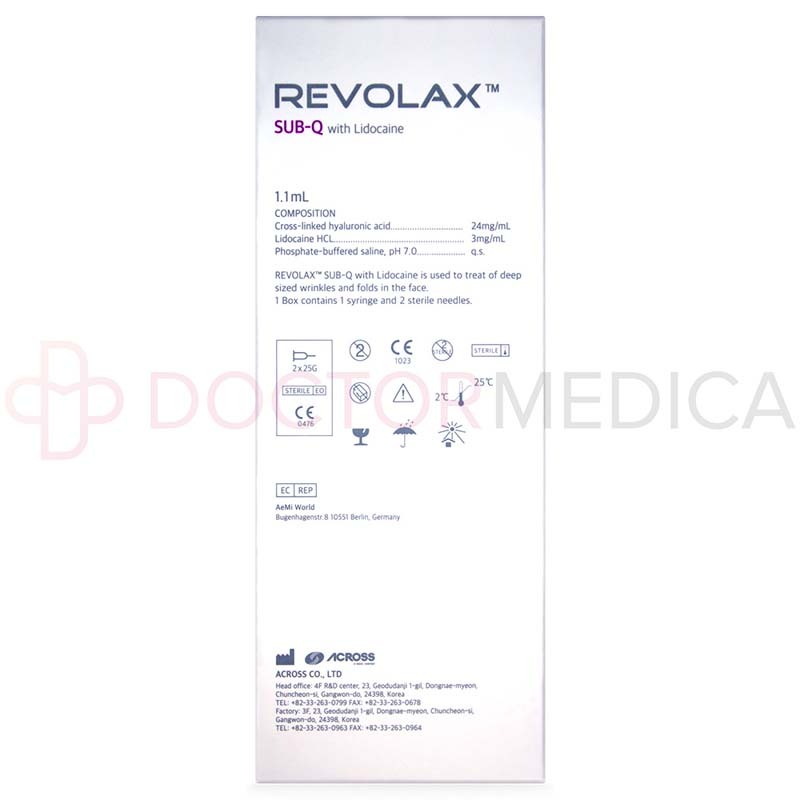 Manufacturer : Across Co., LTD.
Revolax Sub-Q with Lidocaine is a highly volumizing dermal filler, and you can purchase it online from DoctorMedica.co. Alternatively, you can call or email to place your order with our customer service team. Revolax Sub-Q with can be used to restore facial contours and replenish facial volume, so stock up today to help your patients look and feel more youthful. 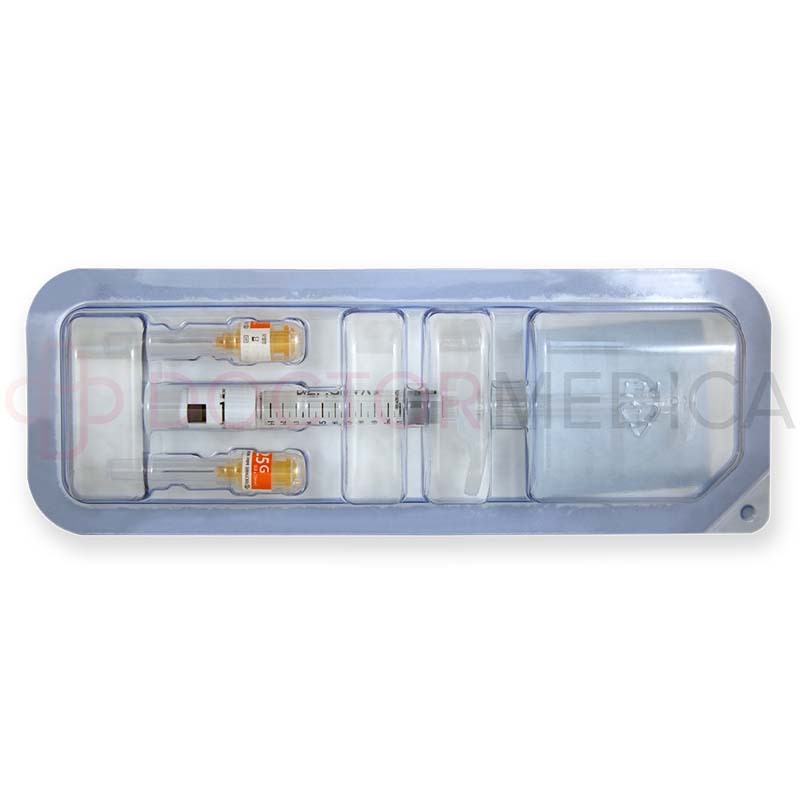 This product is supplied in a prefilled syringe that contains 1.1ml of this solution and 2 sterile needles. A package insert is also provided. With supreme volumizing and lifting capacities, Revolax Sub-Q with Lidocaine corrects substantial facial volume deficits that contribute to many age-related aesthetic defects, including skin folds and sunken areas. To add to that, this filler, like all Revolax fillers, are monophasic and do not contain linear hyaluronic acid, meaning this can be easily injected; this also results in a product with a very smooth consistency that is free of particulates. As a result, the effects of treatment with Revolax Sub-Q are very natural-looking and durable. 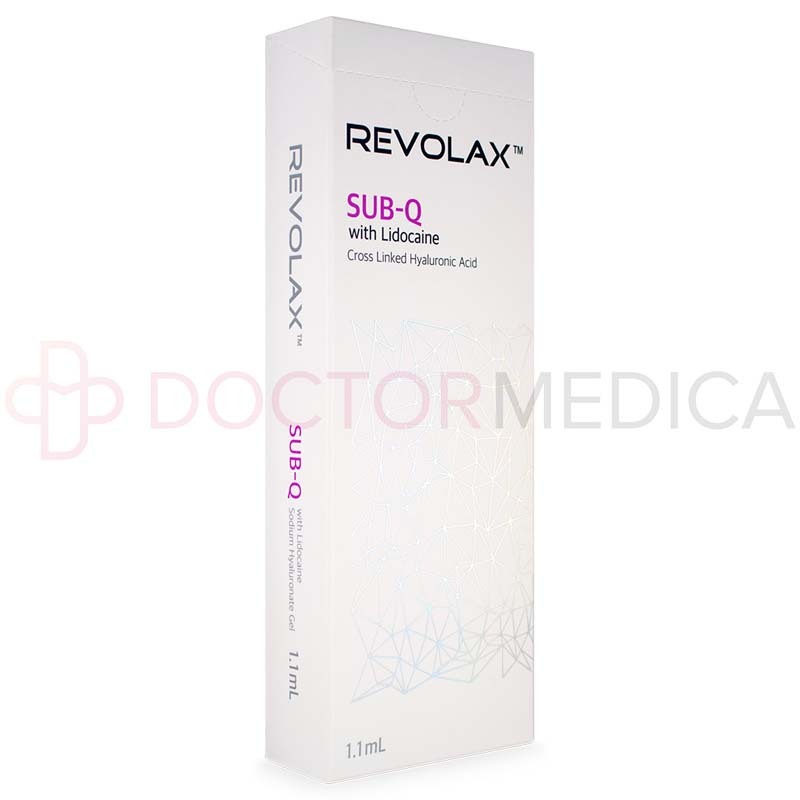 This version of Revolax Sub-Q also contains a local anesthetic for the reduction of injection pain. This product consists of 0.3% lidocaine hydrochloride and 24mg/ml of cross-linked hyaluronic acid. 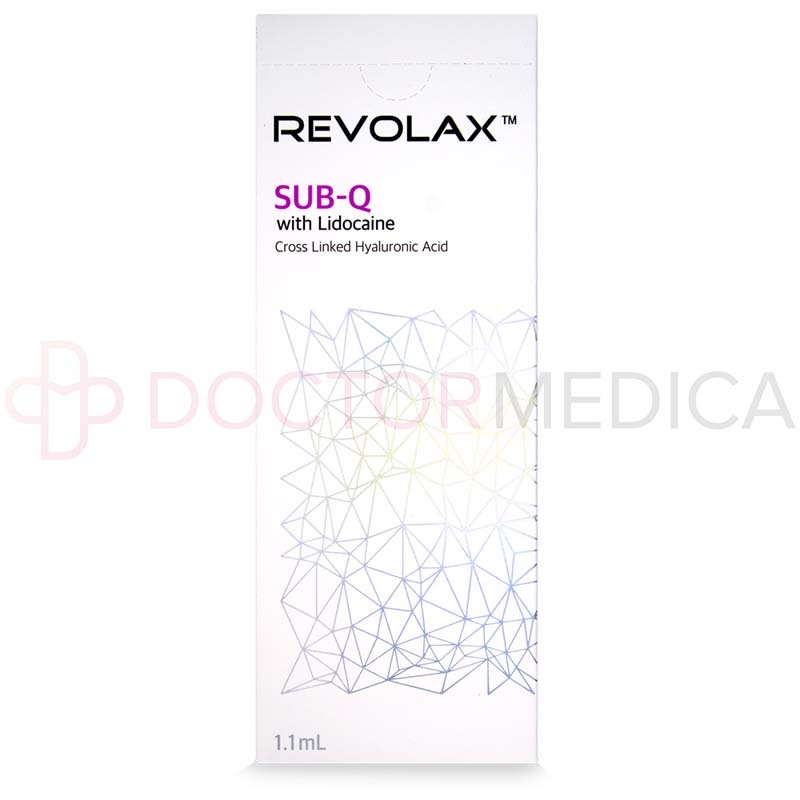 Facial signs of aging can be distressing to a patient, especially if they are premature, so help your patient regain their youthful appearance with Revolax Sub-Q with Lidocaine. This hyaluronic acid gel has a thick and viscous consistency for ultimate soft tissue augmentation. The high viscoelasticity of this product also makes it suitable for recontouring the chin and cheeks and reshaping the nose. 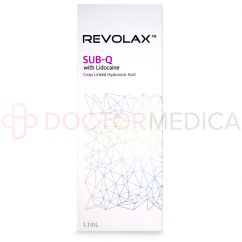 Revolax Sub-Q with Lidocaine should be injected into the deep subcutaneous layer, where it fills out skin tissue and, consequently, replenishes lost volume. This leads to firmer, smoother skin and an overall younger look. This product should be administered by a qualified, fully licensed healthcare professional. Revolax Sub-Q with Lidocaine should be injected into the deep subcutis using a 25-gauge needle. It is recommended to inject the material slowly with even pressure while employing the appropriate injection technique. Once the injection is complete, the treated area should be gently massaged to remove any lumps and to shape the product to fit and conform with the surrounding tissue. Typically, an injection of this product can be performed in one single injection session that usually lasts 15–30 minutes. The patient will need to undergo repeat treatment once the effects start to wear off in order to maintain the results of the initial session. Revolax Sub-Q is indicated for the correction of severe lines and depressions and for soft-tissue augmentation. It is suitable for a variety of applications, including reshaping or adding definition to the chin, cheeks, and nose; correcting very deep and severe wrinkles, lines, and folds (such as laugh lines, forehead lines, and nasolabial folds); and for recreating volume in sunken areas, like cheek hollows. This product can be used on facial areas where deep subcutaneous injection is necessary in respect to volume deficits. Typically, the effects of a Revolax Sub-Q with Lidocaine treatment are expected to last about 12–18 months. It should be noted that the duration of effects depends on a few factors, including the area of treatment; injector experience; and intrinsic factors specific to the patient, such as their metabolism rate, skin type, and lifestyle factors like cigarette smoking and UV exposure. The Revolax brand of dermal fillers boasts unparalleled purity in regard to its hyaluronic acid, thereby ensuring safe usage and high tolerability. Revolax Sub-Q with Lidocaine is highly viscoelastic and has properties that make it an ideal filler to restore or add a significant amount of facial volume. Clinically tested, Revolax Sub-Q has excellent safety and efficacy profiles, so if you order this product, you can rest easy knowing you are getting a high-quality product. Revolax Sub-Q is a dermal filler that has superior volumizing properties and is an ideal treatment for patients who have experienced significant facial volume loss or who are displaying severe skin depressions, such as deep folds or wrinkles. Patients who are looking to enhance certain facial elements, such as the nose or chin, may also use this product. Patients can expect to experience immediate, transient reactions to the injection procedure, which may include redness, swelling, bruising, and pain at the site of injection. As with all procedures involving injections, administering dermal fillers carry the risk of infection. If your patients display any signs of infection, such as persistent tenderness or pain at the infection site that may be accompanied with fever, they should seek medical attention. On occasion, dermal filler treatment has been known to cause more serious complications. These may include the formation of nodules, hypersensitivity reactions, and vascular compromise resulting in tissue necrosis, blindness, or stroke. These complications require immediate medical intervention. The list of side effects presented here is not exhaustive. Please refer to the package insert provided with a box of this product for a full list of contraindications, precautions, and potential side effects.